3/27/2012- The level of play has increased since opening day. 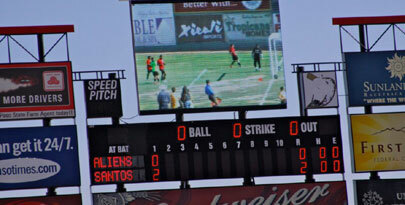 Two of the best teams finally squared off on Saturday as Juarez Juventus tied El Paso Santos 2-2 in Cohen Stadium. The two teams will meet again this Sunday and there is a strong chance the two teams could meet in the Championship Game. The Santos have the leagues three leading goal scorers in Sergio Villalobos, Mario Arrieta and Samuel Alvidrez. Juarez has proved to have the leagues best defense as they are the only team to not lose a game. The Alamogordo Stealth are the surprise team in the league. The are by far the biggest team in the league and that has worked to their advantage.